2019 Subaru Ascent Gallery. Click to enlarge. Subaru used to call its 7-passenger flagship the Tribeca, first introduced for the 2006 model year. The last one rolled off the assembly line in 2014. Customers asked for more room in the third row, more power, and more utility. Now you have it. Subaru's new flagship bears so little resemblance to the Tribeca that they changed the name. They start at $31,995 and range to the mid $40s. See pricing here. With 26 mpg highway fuel economy, a 500 mile range, and NINETEEN cupholders (count them all below), plan on stopping to pee more often than you stop for gas! We're really impressed after driving the Ascent...plenty of power from a compact, and spacious! We couldn't help ourselves in marveling at just how big it is. The passenger compartment is airy, the panoramic moonroof enormous, and the cargo area as big as a contractor van when the seats are folded down. If you need to haul a lot of lass (and/or lad), you're going to love this vehicle. The quality of the materials and the fit/finish are as nice as vehicles costing a lot more. Just wait until you hear the sound system! Designed for excellent interior comfort, passenger access and cargo capacity. The Ascent is an all-new model and comes with three rows of seating, with available bench or captain's chairs in the second row. The SUV is built on a strengthened and extended version of the Subaru Global Platform with extensive use of high-strength steel. With a focus on durability, rigidity and vibration resistance, the Ascent platform is designed to provide a quiet interior and excellent driving feel. Powered by an all-new 2.4-liter BOXER engine, the Ascent comes standard with a new version of Subaru's high-torque Lineartronic® CVT (continuously variable transmission) and legendary Symmetrical All-Wheel Drive system. The all-new Ascent, with a 113.8-in. wheelbase, is the largest Subaru ever built and is the mobile headquarters for the entire family. With 153.5 cubic feet of passenger volume, plus ample cargo space, the Ascent provides room for every passenger and their gear. Rear doors open 75 degrees for improved access to the third row. Eight USB charging ports are available throughout the cabin and a 120-volt power outlet based in the rear of the center console allow charging for multiple electronic devices. With 19 standard cup and bottle holders, every passenger's beverage is secure and close at hand. The Ascent is the most versatile Subaru ever with up to nine unique seating configurations and two rows of 60/40 split flat-folding seats offering up to 72.6 cubic feet of cargo space. The Ascent comes standard with a second row bench seat, providing room for up to 8 passengers. Premium and above trim levels offer second row captain's chairs as a no-cost option and provide occupants with easier access to the third-row. Wide rear door openings, steep C-pillar angles and low entrance point allow easy access for both second and third row passengers. The standard roof rails allow for a number of accessories for carrying items such as bicycles and kayaks. Standard Subaru Symmetrical All-Wheel Drive, 18- inch wheels and four-wheel independent suspension. All-new 2.4-liter BOXER engine that uses a combination of direct fuel injection, high compression (10.6:1), Subaru Dual Active Valve Control System (DAVCS), a twin-scroll turbocharger and an intercooler to achieve outstanding performance and high efficiency. 260 horsepower, 277 lb.ft. tprque. X-Mode® with Hill Descent Control. 5,000-lb. towing capacity, the most of any Subaru in history. Trailer Stability Assist helps to maintain vehicle stability while towing. The TSA system utilizes yaw sensors to monitor trailer sway and then can brake individual wheels to stabilize the vehicle and trailer. 500-mile range on a single tank of gas. Standard EyeSight® Driver Assist Technology that includes Automatic Pre-Collision Braking, Adaptive Cruise Control, Lane Departure and Sway Warning, Pre-Collision Throttle Management, and new EyeSight Assist Monitor (EAM) which provides a heads-up display of the EyeSight system warnings as well as system status information on the windshield of the vehicle. Blind Spot Detection with Lane Change Assist and Rear Cross Traffic Alert are also available. Steering Responsive Headlights are standard on Limited and Touring models. High Beam Assist automatically activates and deactivates the high beams when the system detects a vehicle ahead or oncoming vehicle. Rain Sensing Windshield Wiper system that automatically operates and monitors the wiper speed based on the amount of rainfall is standard on Touring. The Ascent offers the latest STARLINK multimedia systems with a multi-touch high-resolution display screen that features smartphone integration with Apple CarPlay™ and Android® Auto, Aha™and Pandora®, as well as Bluetooth® hands-free phone connectivity and audio streaming, rear vision camera and SiriusXM ® services. Ascent comes standard with 6.5" Multimedia System and higher trim levels feature 8" Multimedia Plus and 8" Multimedia Navigation systems. The base starts with an extensive roster of standard features that includes EyeSight with automatic emergency braking and lane keep assist; a 6.5-inch multimedia touchscreen; Android Auto and Apple CarPlay; four USB ports; three zone automatic climate control; automatic power door locks and power side mirrors; raised roof rails; second-row bench seat (8 passengers); 18-inch aluminum-alloy wheels with silver finish: 19 cup and bottle holders; multi-function display; and security system with engine immobilizer. Standard on all models is Auto Vehicle Hold which keeps the vehicle in position at a stop so the driver does not need to continuously depress the brake pedal. For the first time in a Subaru, a convex cabin-view mirror that allows the driver and front passenger to view occupants in the second and third row is standard equipment. The Premium trim adds Blind-Spot Detection with Lane Change Assist and Rear Cross-Traffic Alert; towing capability up to 5,000 lb. ; power driver seat; unique spill-repellent cloth upholstery in either black or ivory; 8.0-inch multimedia touchscreen; Wi-Fi connectivity; body-color side mirrors; privacy glass; leather-wrapped steering wheel and shift lever handle; rear seat climate controls; 18-inch aluminum-alloy wheels in gray with machine finish; and the All-Weather Package with heated exterior mirrors, 3-mode heated front seats and windshield wiper de-icer. Stepping up to the Premium trim allows wider option availability, including second-row captain's chairs; Reverse Automatic Braking; 20-inch dark gray with machine finish wheels; and a panoramic moonroof. Also available is a power rear gate with height memory; Keyless Access with Push-Button Start; 8.0-inch Multimedia Navigation system; auto dimming rear view mirror; and a tonneau cover to conceal cargo. The Limited includes all the Premium trim features and adds leather-trimmed upholstery, LED Steering Responsive Headlights with High Beam Assist, LED fog lights and new second-row retractable sunshades. Also standard is a set of 20-inch aluminum-alloy wheels in dark gray with machine finish mounted on 245/50 R20 all season tires. Lower door cladding with chrome accents and body-color side mirrors with integrated turn signals; driver's seat adjustable thigh support; Reverse Automatic Braking; power rear gate with height memory; and Keyless Access with Push-Button Start are also standard equipment on the Limited. Two additional USB ports are added to Limited, to bring the total number to six. The top of the line Touring model is distinguished by satin silver side mirrors with integrated turn signals, chrome door handles, chrome front under guard and rear bumper protector. The unique interior features Java Brown leather seats and upholstery; upgraded leather steering wheel and woodgrain-pattern matte finish accent trim. Standard three-mode ventilated driver and front passenger seats enhance the comfort in the Touring model. A total of eight UBS ports and 120-volt power outlet for charging tablets, phones and laptops is standard. The Touring includes all standard features from the Limited and adds the SUBARU STARLINK 8.0-inch Multimedia Navigation system, Harman Kardon® premium audio system with 14 speakers, panoramic power moonroof and rain-sensing wipers. To improve the driver's view, a unique Smart Rear-View Mirror and a 180-degree front-view camera complete Touring's comprehensive list of features. This is the 2019 Subaru Ascent Concept. You can expect the production model to vary somewhat from these photos (for example, the side mirrors are smaller than the mirrors that you would expect on the final version). When will the 2019 Ascent arrive? The release date is estimated for second quarter of 2018. Subaru used to call its 7-passenger flagship the Tribeca, first introduced for the 2006 model year. The last one rolled off the assembly line in 2014. Customers asked for more room in the third row, more power, and more utility. They will soon get it. Subaru's new flagship bears so little resemblance to the Tribeca that they are changing the name. Expect to buy the first Ascent in 2018 as a 2019 model. Media reporting a "2018 Subaru Ascent" are off by a year. The exterior design of the concept follows Subaru's "Dynamic x Solid" theme with powerful fender flares representing Subaru's all-wheel drive system and a large, bluff grille denoting a true SUV. Subaru will offer its latest infotainment system, introduced on the 2017 Impreza, and will include Apple Car Play and Android Auto. Subaru will build the Ascent on its new "global platform." Basically, Subaru is moving toward a single chassis that will underpin all of its vehicles. (Subaru will add length or width as necessary to suit the size of the vehicle). This scalable architecture allows Subaru to focus engineering resources on building a single platform that rivals the best produced by any manufacturer, instead of having a variety of "pretty good" frames. The new platform is stronger for better handling, and the extensive use of high-strength steel improves fuel economy and crash protection. Subaru will manufacture the Ascent at its sole North American plant in Lafayette, Indiana. Both the design concept and the production Ascent will feature an all-new turbocharged direct injection boxer engine with plenty of power to move lots of people and cargo. Ascent will compare favorably in size to Ford Explorer, Honda Pilot, and even the Chevy Tahoe. Note the large storage area, even with the third row in place. Also note the large panoramic moonroof. Looking to buy or lease a new 2019 Subaru third-row Ascent? 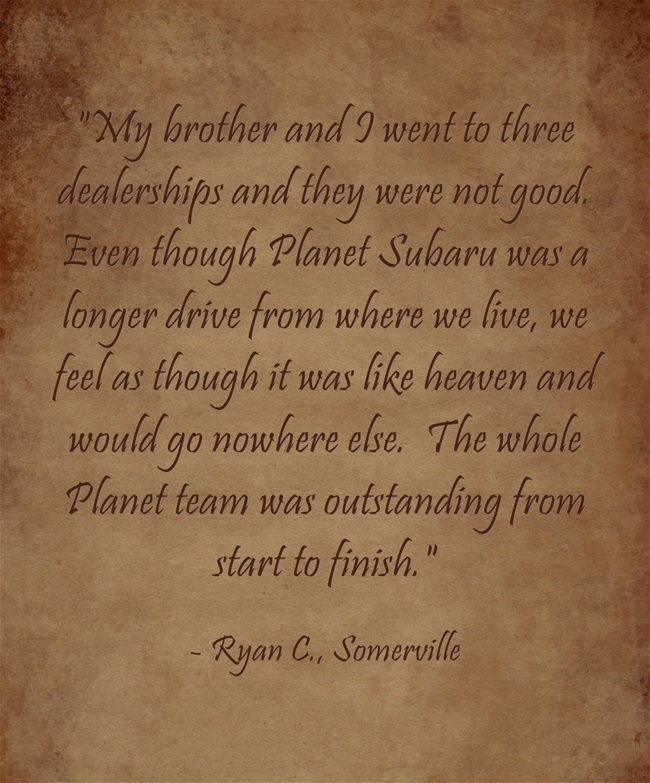 We love helping people from Boston get a great deal on a new Subaru, and we take luxurious care of you if you're from Cape Cod, the South Shore, or anywhere in Massachusetts.